On Saturday, January 27, 2018, members of the Florida chapter of the neo-Confederate League of the South (LOS) emerged from a Tallahassee parking deck and made their way toward the state’s capitol to host their first rally of the new year. 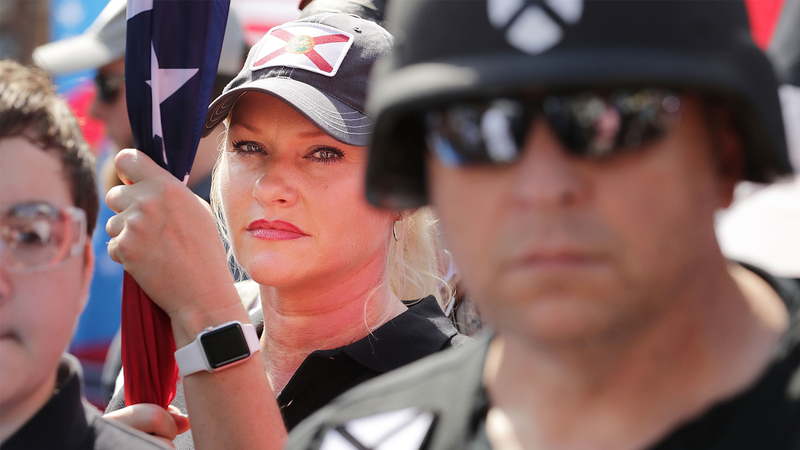 They were met by a massive crowd of counter-protesters bearing signs and chanting slogans decrying the League’s desire for an all-white ethnostate in the Southeastern United States. As the ragtag group of 30 League members — which included president Michael Hill and Florida chairman and chief of staff Michael Tubbs — attempted to salvage the day, several of their members took to trading taunts with the large crowd. One Florida League member stood out in particular due to his clipped New England accent, large frame and oddly specific chant of “No more RuPaul,” which he bellowed across police lines through cupped hands. In addition to attending the League rally in January, the same man marched with the League at the deadly Unite the Right rally in Charlottesville, Virginia, last August. His name is James “Jim” O’Brien, a 43-year-old Giants football-loving native of Queens, New York and former employee of the Blackwater mercenary group who bragged about his ties to the Bush family. The details of O’Brien’s fall from grace and late-life conversion into a belligerent “southern nationalist” read more as a B-list screenplay that exists somewhere between Burn After Reading and War Dogs than reality, and were they not gleaned from testimony sworn under oath, would be charitably described as outlandish. Presented warts and all, this is the story of Jim O’Brien. O’Brien has taken to the internet to share his every thought on topics ranging from his most recent bowel movement, his self-assessed virility and his own brilliance and vanity, but his story is best told in O’Brien’s own words and admissions in courtroom testimony, amid a series of devastating losses that bankrupted his middling career as a federal subcontractor during the early 2000s. The events led him down the rabbit hole of far-right indoctrination and radicalization to where he stands today, a fitting testimony to the state of far-right politics. In October of 2010, Jim O’Brien was president and CEO of Tamerlane Global Services (Tamerlane), a sub-contracting company with “specific expertise in moving cargo in conflict zones on the ground,” especially across conflict zones such as Afghanistan and Pakistan. O’Brien cultivated this skillset — exploiting the frontier boom the middle east conflict offered for war profiteers — after serving in the United States Marine Corps. 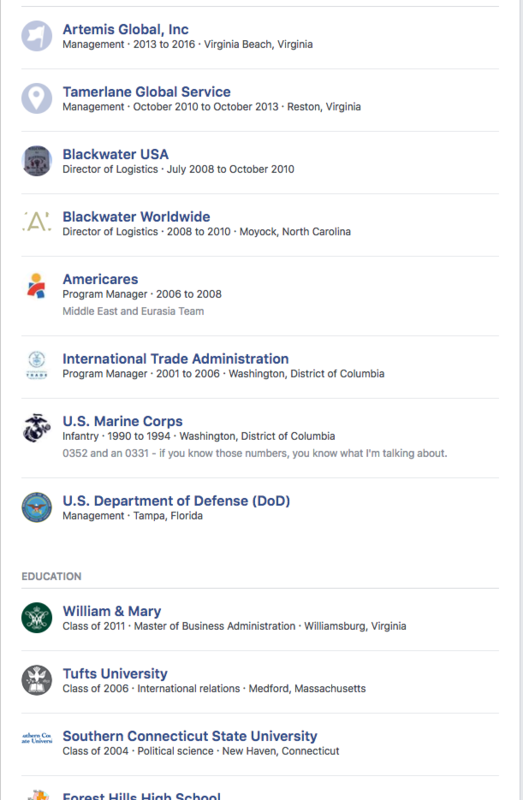 O’Brien’s courtroom biography is corroborated by the “About Me” section of a Facebook profile previously identified by Hatewatch as belonging to O’Brien. In front of the judge, O’Brien painted a picture of himself as a struggling young parent who cashed out his 401(k) and sacrificed time with his wife and young daughters to brave the dangers of early 2000s middle-eastern war-zones. The rosy picture of an all-American “by my bootstraps upbringing” and work ethic is certainly not the whole truth. His social media posts from the time portray a different man, this one a braggart boasting aboutfirst-class flights, expensive liquor, gourmet food and four-star entertainment. What O’Brien neglected to mention in his biographical statements was his military discharge for failure to report to his post in 1992 at the age of 18, a conviction for issuing a bad check at the age of 1993 and a reckless driving offense in 2012. These youthful indiscretions serve to illustrate that the substance of Jim O’Brien’s person hardly comports with his self-presentation. The plaintiff in the aforementioned case, Global Hub Logistics (GHL), began its relationship with Tamerlane shortly after O’Brien founded it in 2010. Tamerlane had been issued over $2 million by Liberty for the shipping of various pieces of military equipment. Although they initially abided by their contractual obligation to pay GHL for services provided, the complaint maintains that Global eventually ceased payment amid myriad excuses and redirections. By mid-2011, things had soured to such an extent that Global Hub Logistics informed O’Brien and Tamerlane that “pending work orders, it would terminate its relationship with Tamerlane, and it did so on July 1, 2011." The threat of legal complaints and arrests of the plaintiffs never materialized. This was a frequent scare-tactic used by O’Brien in a case that wound up stretching into 2013. After numerous countersuits, motions to dismiss, counsel substitutions, and various spurious allegations against Roshan, Global Hub Logistics and Joseph Yorio (former president of Blackwater/Xe services, where O’Brien had been employed) failed to hold up in court, a jury returned a verdict against Tamerlane for $1,937,559.00 plus costs. In October of 2013, O’Brien stopped paying his bills again, this time for his legal fees. Although O’Brien apparently sought post-judgment representation with another firm. His appeals would ultimately be denied. As though a $2 million judgment against his company weren’t enough, O’Brien’s troubles were just beginning. In February of 2014, another Tamerlane client, STI Emirates Logistics, LLC, filed suit against O’Brien’s firm for complaints similar to Global’s. On December 12, 2014, a court found in favor of STI, ordering Tamerlane to pay $208,659.04 plus costs for “breach of contract for the MSA [master services agreement] and (2) breach of contact for the promise to pay." To make matters worse, SIGAR, or the Special Inspector General for Afghanistan Reconstruction, the military oversight body whose responsibility is to ensure that American businesses taking on federal contracts in Afghanistan are not engaging in fraud, deception or wanton waste. Essentially, SIGAR’s raison-d’etre is to prevent petty grifters like Jim O’Brien from profiteering from the war effort through fraud and abuse. As the facts of O’Brien’s indiscretions at the helm of Tamerlane came to light, so, too, did the aforementioned biographical omissions regarding his discharge from the Army. The end result was government-wide debarment from federal contracts for three years. O’Brien was still listed by name on SIGAR’s website as recently as March 31, 2016, as well as an apparent alias the names of his two companies. The debarment of “Artemis Global, Inc., d.b.a. “Artemis Global Logistics and Solutions,” d.b.a. “Artemis Global Trucking, L.L.C.” O’Brien, James Michael, a.k.a. “James Michael Wienert” Tamerlane Global Services, Inc., d.b.a. “Tamerlane Global, L.L.C.,” d.b.a. “Tamerlane, L.L.C.,” d.b.a. and “Tamerlane Technologies, L.L.C.” was slated to expire this January. The far-right movement has seen its fair share of grifters and scammers over the years, but perhaps none as blunderingly inept as Jim O’Brien. With over $2 million in judgments against Tamerlane and barred from taking on new contracts, O’Brien chose to get creative. Unfortunately, his past would soon catch up. On July 23, 2015, another case was filed against Tamerlane in Virginia’s Eastern District, this time with two additional defendants in tow: Jim O’Brien, personally, and Artemis Global, Inc. The plaintiffs, Tigers Limited and Tigers (USA) Global Logistics, hereafter referred to simply as “Tigers,” alleged that following the debarment of Tamerlane, O’Brien constructed an elaborate shell-game in order to pass funds from one ruined business venture into another. O’Brien’s relationship with Tigers predated the founding of his new company, Artemis, on November 12 of 2013 — scarcely more than a week after the verdict against Tamerlane — with a former Tamerlane employee, Candice Kennedy. O’Brien owned 50 percent of its shares. Screenshot from Jim O’Brien’s Facebook describing the transition from Tamerlane to Artemis during the timeframe in question. Screenshot from Candi Kennedy O’Brien’s Facebook describing the transition from Tamerlane to Artemis during the timeframe in question. Testimony and evidence provided by Tigers representatives paints a picture of O’Brien shifting valuable contracts and assets away from Tamerlane’s sinking ship without informing his clients. In one instance a Tigers employee only found out that they would no longer be doing business with Tamerlane when O’Brien’s email domain changed in the middle of correspondence. O’Brien had not informed Tigers of the judgment against Tamerlane or of his pending disbarment while he put the pieces in place to get Artemis afloat. The whole charade came crashing down after a “third party called Ghazanfar,” a trucking company contracted to move several loads of cargo, withheld one of two cargo shipments due to payments owed by O’Brien. Tigers maintain that O’Brien concocted an elaborate tale rather than owning up to his debts. When Tigers asked about the status of the cargo and payment to Artemis' subcontractors, O’Brien made up a fantastical story that unnamed truckers had been "gifted" the cargo in Pakistan, that Artemis had already paid the truckers $100,000 of its own money and that he was heroically braving the elements of Pakistan with briefcases of cash to negotiate with tribal "elders" for the release of the cargo. As it turned out, Tigers’ cargo had never entered Pakistan as none of the funds had gone to the subcontractor, and O’Brien never met with anyone in Pakistan to resolve alleged disputes. Although he could have represented himself in court pro se, corporations are not afforded that option and as such the judge granted O’Brien enough time to seek counsel. O’Brien’s situation did not improve. In attempting to untangle the convoluted web of where Jim O’Brien began and Tamerlane and Artemis ended, the plaintiffs unearthed the tangled mess that was Jim O’Brien’s life. While he was going through a divorce with his then-wife, O’Brien was paying off her credit card out of Artemis’s bank account. Other payments were going toward his personal Visa. At the same time, he was paying for a luxury vehicle for a past employee, Candice Kennedy’s ex-husband. O’Brien and Kennedy were apparently living together at the time in spite of O’Brien’s devout Catholic faith and marriage. It also emerged that O’Brien and Kennedy represented Artemis as a “veteran-owned” and “woman-owned” business, claims which the business could not make due to O’Brien’s discharge from the army and the federal requirement that Kennedy hold more than a 50 percent share of the business. Ultimately it was decided that the plaintiffs had not provided sufficient evidence for the court to hold Jim O’Brien personally liable for Tamerlane and Artemis’s malfeasances. Hearing that he had been cleared of any personal liability, O’Brien was conspicuously absent on the final day of questioning, leaving Kennedy alone in the witness box. The court found in favor of Tigers, awarding them half a million dollars from either Tamerlane or Artemis. Apparently, the difference between the two companies was indiscernible on the part of the jury. Shortly thereafter, Jim O’Brien and Candi Kennedy relocated to Gainesville, Florida, where O’Brien found employment with a roofing company. While it is unclear when exactly O’Brien first became affiliated with the LOS, one detail from the Tigers trial stands out. In May of 2016, the judge attempted to schedule a subsequent court date. O’Brien indicated he would be unavailable for a proposed June court date as “I'm going to be in Alabama the 25th through the 27th for business reasons.” These dates roughly coincided with the League of the South’s 2016 National Conference, held on June 24 and 25. Facebook posts by O’Brien across the period paint a stunning portrait of radicalization. In four short years, O’Brien went from mourning the death of Nelson Mandela and lionizing his hometown New York Giants, to creating a racist blog intended as "a 'red pill' site for conservative normies," and posting on the needs of whites to "dominate the resources of a bountiful territory – the United States and Europe." A screenshot of Jim O'Brien's Facebook post on Dec. 6, 2013. I have worked extensively in Sub-Saharan Africa. I consider Sub-Saharan Africa to be a glimpse into our most primal state; it is what Europeans once were before evolution – both genetically and socially … I also saw a lot of rapes in Africa. It is the BIOLOGICAL weapon of choice by most of the small armies on the ground (for which, there is an abundance). Per O’Brien’s own testimony, at the time of their trial with Tigers, Artemis/Tamerlane essentially had one client, Maersk. While it is unclear whether O’Brien was in Wetumpka that weekend, or had any familiarity with the League of the South, it provides a possible window into when his involvement with LOS may have begun. Since his involvement with the League of the South, O’Brien’s posts have become increasingly violent. A screenshot of Jim O'Brien's Facebook post. In order to accommodate his new identity, O’Brien has turned his back on his roots in Queens and instead asserted that his “southern” identity deserves his every ounce of loyalty. As regards his football team of choice, the recent debate over NFL players kneeling during the national anthem gave O’Brien cover to distance himself from his past fandom. When O’Brien attended the Charlottesville Unite the Right rally, Candice Kennedy was present, highly visible wearing a black hat and bright red lipstick. Kennedy was likely looking on as O’Brien punched a woman in the face as she was walking away from a gang beating by members of the League of the South. O’Brien was later arrested in a parking garage as he attempted to break into his rental car and was found by police to be carrying a pistol without a permit. Shortly thereafter, O’Brien lost his job as the press began to pick up details of his affiliation with the violent rally and the League. The story of Jim O’Brien is indicative of the sort of person that the American far-right tends to attract. While O’Brien attempted to leverage his bona fides as a veteran, small-business owner and exemplar of the American Dream, the truth is always more complicated. Rather than own up to his own failures, O’Brien tried all manner of legal obfuscation and revealed a nasty impulse toward baleful denunciations and attacks when provoked. As his options have run out, O’Brien has turned on everything that he once prided himself on and joined the ranks of reactionary malcontents railing against the present order. Michael Hill and Michael Tubbs should know better than embracing the company of a known fraud, huckster and liar who is likely to burn them as he has his past associates. If he is allowed to stick it out and the League does get the war they so badly desire, Hill and Tubbs would be well advised to outsource their logistics to someone other than Jim O’Brien.